As you are probably aware, most of our medicines ultimately come from natural sources. They are derived from natural products, although they have often been modified in some way in order to limit side effects or maximise their effectiveness. You probably also know that the contents of a pill you get from the pharmacy does not come directly from nature. More likely, it is a synthetic product. Pharmaceutical companies make these compounds from smaller, more readily available starting materials. The total synthesis of natural products provides an interesting context for reactions of organic molecules. We can see where familar reactions have been used to make something important. Whether or not the natural product is ever developed as a commercial drug is beside the point. Often, the exercise of making one compound provides answers that allow researchers to find a better way to make another compound. Looking at reactions within an actual synthesis also forces us to develop some spatial reasoning skills. We need to be able to recognise familiar reactions in unfamiliar contexts. For example, in the following sequence of steps, a set of reagents has been left out. How would we get from one compound to the other? The first thing we need to do is block out the infromation we don't need to worry about right now. We'll circle the one reaction that is missing information, and focus only on that one. The compound on the right still looks pretty similar to the one on the right. We might try circling the part of the molecule where we can see a difference. That way, we can focus on what reagents would make that difference. What kind of reaction is happenning here? It looks like an aldol reaction. We'll put some typical reagents in the box. First, we'll add a base, to remove a proton from the alpha-position (the acidic hydrogen next to the carbonyl, in the blue ellipse on the left). Second, we'll add the electrophile that would lead to the product on the right. Those might not be exactly the same conditions used by the researchers in this synthesis, but it is a reasonable idea of what needs to be added. In the following example, an intermediate product has been left out. It is the product of the first reaction, but the starting material for the second reaction. Once again, we might do an exercise to focus on the important part of the question. What is the electrophile? What is the nucleophile? On the left, there is an aldehyde. It's a carbonyl compound, so maybe it is an electrophile. We'll circle it in blue. Above the arrow, there is a phosphorus compound. It does not have a positive charge as shown, but there is a very positive phosphorus atom because of the attached oxygens. There is also a base present, although it's a relatively weak one. Maybe we will remove a proton next to the phosphorus to make an ylide. Ylides are good nucleophiles. If we are correct, the ylide would combine with the aldehyde to make a C=C double bond. The phosphorus would remove the oxygen atom from the aldehyde. The resulting compound is shown in the box. Sometimes, our guesses can be confirmed by looking further ahead in the synthesis to see evidence for the compound we think has formed. In this case, the product of the second reaction may be complicated enough to make that process difficult (even if we already know something about alkene oxidations). Practice the methods described above to fill in the missing reagents. Practice the methods described above to fill in the missing products. Because chemists are generally working toward a specific synthetic target, they frequently need to work backwards to plan out a series of reactions that will produce the desired compound. A good memory of specific patterns that occur in reaction products can help to identify what reaction is needed to get there. For example, if the product contains a cyanohydrin, a CN attached to the same carbon as an OH, then it may be possible to construct that part of the compound using addition of cyanide to a carbonyl. This type of thinking is called "retrosynthetic analysis". The open arrow shown above is called a retrosynthetic arrow, and it roughly translates as "can be made from". That is, the cyanohydrin on the left can be made from the carbonyl compound on the right. By working backwards through a series of such reactions, we could eventually arrive at simple starting materials that could be used to make a very complicated molecule. This approach to thinking about how to make organic molecules is generally attributed to E. J. Corey of Harvard University. Corey was awarded the Nobel Prize in chemistry for his transformative work in organic synthesis. Other retrosynthetic patterns may be familiar to you at this point. For example, an alcohol could always be made from reduction of a carbonyl. On the other hand, it may be more convenient to make the alcohol via addition of a Grignard reagent (or something similar) to a carbonyl. That approach may be especially appealing if the alcohol carbon is attached to a common hydrocarbon fragment such as a vinyl, a phenyl or an alkyl group. So, there are a number of ways in which an alcohol could be incorporated into a molecule. Other functional groups are also commonly targeted in this approach. For example, alkenes are very frequently added via Wittig or Horner-Wadsworth-Emmonds reactions, which make use of phosphorus ylides. Epoxides are often added via the Corey-Chaykovsky epoxidation, just one of many reactions named after E. J. Corey. This reaction uses a sulfur ylide. Sometimes a wider collection of atoms indicates a particular route to the target. For example, the pattern carbonyl-carbon-alcohol -- or C=O-C-COH -- would result from an aldol reaction. An enone -- that is, a C=O-C=C pair in conjugation -- also suggests origins in an aldol reaction, although the aldol in this case resulted in a condensation or dehydration. These relationships between products and the starting materials that they can be made from are useful in planning out syntheses. The ones we have looked at here involve only the addition to carbonyls of anionic and semianionic nucleophiles, as well as ylides. There are plenty of other such relationships in other areas of organic reactivity. Perform retrosynthetic analysis in each of the following cases, proposing something that the compound could be made from. 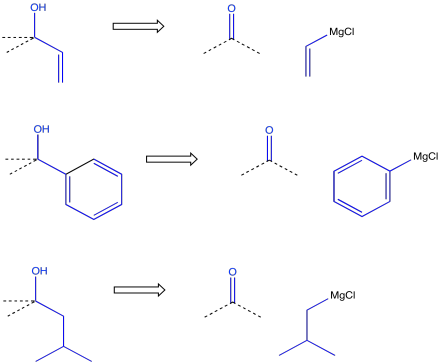 Practice the methods described above to fill in the missing reagents and products in the following synthesis. Requires knowledge of anionic and semi-anionic nucleophiles, aldols and ylides. A list of possible reagents is provided below the roadmap. Use the reagents below to finish the tulearin A roadmap. Practice the methods described above to fill in the missing reagents and products in the following synthesis. Requires knowledge of anionic and semi-anionic nucleophiles, aldols and ylides.